This spacious 4 bedroom, 3 bathroom holiday house is surrounded by palm trees and overlooks a childrens playground and beach. From the large balconies you can watch the children playing on the sand or the playground. Have a BBQ on the deck or take a 20 m stroll to the Frothy Coffee Boatshed at the waters edge for delicious light meals and coffee. Amaroo Beach/Smiths Lake is a salt water inlet and an easy 3 hour drive north of Sydney and 20 minutes South of Forster. Great for weekends away. 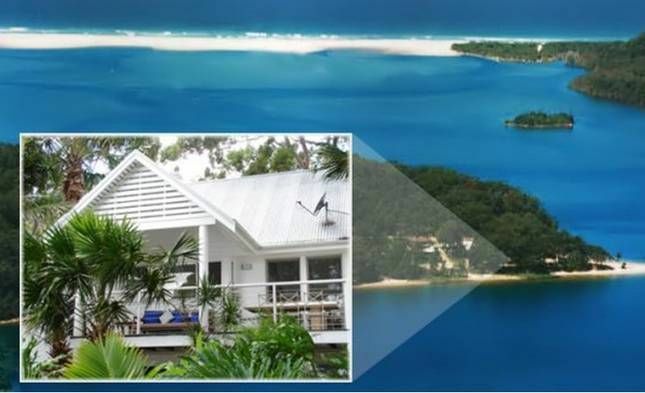 It is located on the point with panoramic water views, the interior has a lovely spacious feeling to it with raked timber ceilings. This 4 Bedroom beach house has 3 bathrooms, the main with a spa bath. Upstairs the large open living area with floor to ceiling glass windows and doors, opens to an entertaining deck and spectacular water views. The kitchen is fully equipped including dishwasher and microwave etc. Also on this level are two bedrooms, both with a queen size beds both rooms opening onto a private north facing deck. The downstairs rumpus room has TV, VCR/DVDs and a slow combustion log fire for those winter weekends away. Downstairs also offers one bedroom with queen size bed and ensuite and another bedroom with one single bed , two sets of bunks and an ensuite. If needed there is also a small double sofa bed in the reading lounge. The Lake is a saltwater inlet separated from the ocean by a natural sandbar. The water directly in front of the property is calm with no surf and offers swimming, fishing, watersports and a sandy beach. The boat ramp located next to the Frothy Coffee offers easy water access. The local surfbeaches Blueys, Elizabeth and Boomerang are a short drive away. Other nearby activities include golf, tennis, bushwalking, local markets, 4WD trails and horseriding. Just a short stroll away are the local shops offering a supermarket, butcher, bakery, bottle shop and takeaway food. Forster/Tuncurry is only a 20 minute drive and offers a large shopping centre, cinemas, restaurants, clubs, boat and fishing cruises. Note: Smiths Lake is a Salt Water lake and is regularly open to the ocean. When it is closed the water level can rise 1 to 2 metres and the size of the beaches near the house can vary. Most of the photographs were taken with the lake open and the water level low. A few of the photos show the surf beach on the other side of the lake. This is a lovely house near the water with great views. We have rented this house before and love it. Property is very clean and of a high standard plenty of room for the family and would be happy to recommend it to friends and family. There is a play ground for children adjacent to the property & a café/restaurant near by. The property has secure fencing all round, so our furr child was able to have freedom to run around & we had peace of mind knowing he wouldn’t escape. Everything was perfect. Very clean and comfortable. Loved the decor, the location and the spectacular bird life. Also appreciated that the home actually catered for the number of people it advertised as accommodating with ample beds, seating, cutlery, crockery and bathrooms. Lots of extra touches were a bonus. Thank you very much for a very enjoyable stay. We loved our little family getaway to this absolutely amazing property in such a beautiful spot. This house was everything and more for what we hoped for. What more can I say beautiful house in a beautiful spot. Will definitely be returning. Wonderful few days spent at Smiths Lake in the beautiful Monkey Villa. Perfect accomodation for 2 or 3 families. So much space for everyone to spread out and relax. The kitchen was really well equipped for cooking up a storm. And waking up to that view every morning was just fantastic. Such a beautiful and serene corner of the world. And we were very lucky to have perfect sunny winter days. Can’t wait to book another trip in the near future. Thank you.